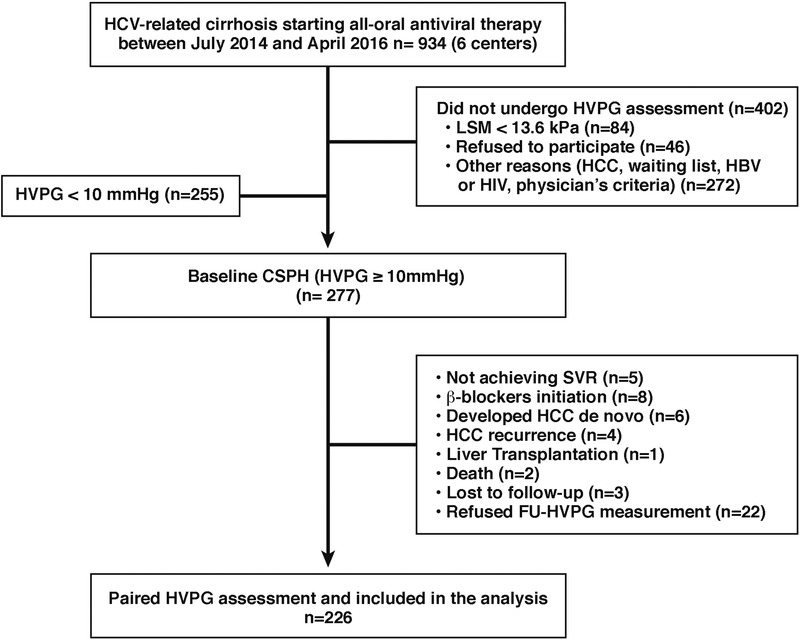 A sustained virologic response (SVR) to all-oral therapy in patients with hepatitis C virus (HCV)-associated cirrhosis significantly reduces the hepatic venous pressure gradient (HVPG), researchers report in the November issue of Gastroenterology. Nevertheless, almost 80% of patients maintain significant portal hypertension and have a continued risk of decompensation. Left: mean HVPG, before (white) and after (black) SVR to antiviral therapy. Right: Proportions of patients in each HVPG range before and after SVR. In patients with compensated cirrhosis, an HVPG of 10 mmHg or greater (used to define clinically significant portal hypertension) is associated with increased risk for decompensation, development of hepatocellular carcinoma (HCC), and death. Treatment with direct-acting antiviral agents leads to an SVR in more than 90% in patients with HCV-associated cirrhosis. However, it is not clear whether curing the viral infection affects HVPG—especially in patients with clinically significant portal hypertension. Sabela Lens et al studied 226 patients with HCV-associated cirrhosis and and clinically significant portal hypertension to investigate hemodynamic changes following their SVR to interferon-free therapy. The authors determined portal pressure gradients based on HVPG at baseline and 24 weeks after therapy; patients also underwent right-heart catheterization and liver stiffness was measured at these time points. Most of the patients (75%) had esophageal varices, 21% were Child class B, and 29% had at least 1 previous episode of liver decompensation. Lens et al found that the median HVPG decreased from 15 mmHg before treatment to 13 mmHg after the patients’ SVR to treatment (reduction of 2.1 ± 3.2 mmHg) (see figure). HVPG decreased by 10% or more from baseline in 140 patients (62%) and by 20% or more in 90 patients (39%). However, clinically significant portal hypertension persisted in 78% of patients. One hundred forty-two patients (63%) still had an HVPG ≥12 mmHg and 57 patients (25%) had an HVPG ≥16 mmHg after an SVR. Thirty-nine patients (17%) had an increase in HVPG despite achieving an SVR (a mean increase of 2.8 ± 1.7 mmHg). In multivarite analysis, baseline level of albumin below 3.5 g/dL was the only factor associated with an HVPG reduction of 10% or more. Liver stiffness decreased from an average 27 kPa before treatment to 18 kPa after SVR. However, one-third of patients with a reduction in liver stiffness to below 13.6 kPa after SVR still had clinically significant portal hypertension. 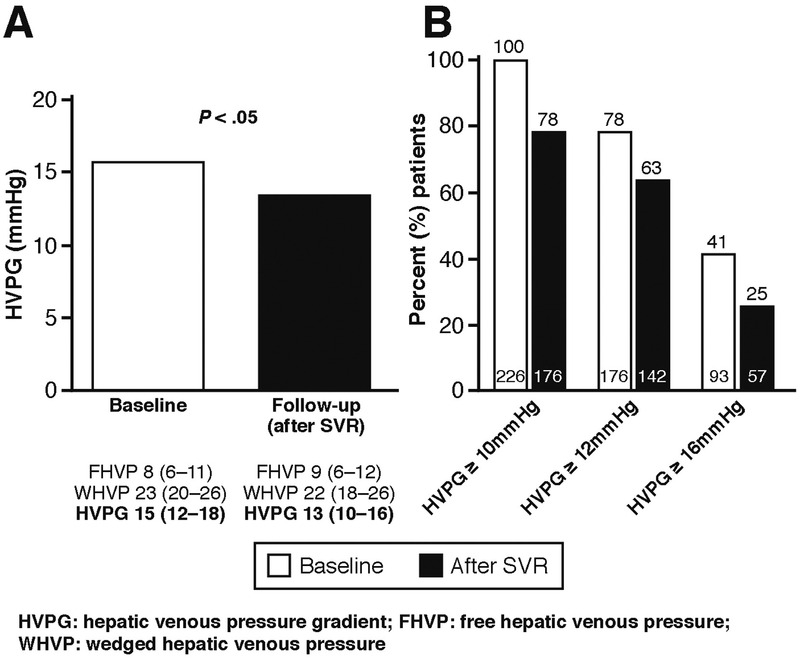 A higher baseline HVPG and a lower decrease in liver stiffness measurement after treatment were associated with persistence of clinically significant portal hypertension after an SVR. The patients’ systemic hemodynamic features improved after their SVR to therapy. Interestingly, pulmonary hypertension was present in 13 patients at baseline and 25 after SVR, although only 3 patients had increased pulmonary resistance. The authors calculated that a liver stiffness cut-off value of 21 kPa could identify patients with clinically significant portal hypertension after SVR with a 91% positive-predictive value. However, Lens et al state that of the 37 patients with follow-up liver stiffness measurement below 13.6 kPa, 16 patients (43%) still had clinically significant portal hypertension. What were the long-term outcomes of these patients? Five patients developed de novo decompensation (4 ascites and 1 hepatic encephalopathy) a mean of 22 weeks after treatment initiation. Six patients with previous liver decompensation had a new episode or worsening of current decompensation within a mean period of 14 weeks after treatment initiation. Five patients with ascites developed hepatic encephalopathy, variceal bleeding, or worsening of ascites, and 1 patient with a previous variceal hemorrhage had a new bleeding episode. Lens et al pointed out that all patients had persistent clinically significant portal hypertension at the last follow-up time point. HCC was diagnosed in 2 patients (1 and 8 weeks after treatment initiation), and in 1 patient with previous HCC who was in complete remission 24 weeks after initiation of antiviral therapy. The authors remind clinicians that patients with clinically significant portal hypertension after an SVR remain at risk for liver-related complications.